The wardrobe adaptability of the Emir of Qatar Hamad bin Khalifa al-Thani is very telling. The same goes for his cousin, Prime Minister Sheikh Hamad bin Jassim al-Thani. When it serves their purposes, Qatar’s staggeringly wealthy two most powerful players strut about in very traditional Arab garb. But when the occasion deems it expedient, they soothe subliminal western anxieties by donning tailored suits of the exceptionally elegant sort that proliferates in European Union forums. That purportedly imparts an impression of trustworthiness. The cousins’ policy line is just as chameleon-like. There’s a yawning gap between their utterances in English and in Arabic. Not too many years ago, Qatar was an Israeli success story, or so it was widely believed in Jerusalem. Relations with Doha, especially trade ties, flourished since the mid-Nineties. They weren’t formal or full, yet they were hardly covert. Everyone knew about them. Unnamed Qatari higher-ups had reportedly visited Israel and Shimon Peres, then deputy premier, openly visited Qatar in 2007. Tzipi Livni did the same a year later. Other Israelis, such as Ehud Barak, hobnobbed with the emir. But Qatar unilaterally abrogated these ties after Operation Cast Lead. Doha offered to restore them if Israel allowed unrestricted shipments of building materials to Gaza. Since these can be used to build bunkers, Israel refused. However, the Qatari transformation isn’t only Israeli-linked. Qatar had become the financial sponsor of the misnamed Arab Spring, bankrolling assorted Muslim Brotherhood insurgents and their allies. 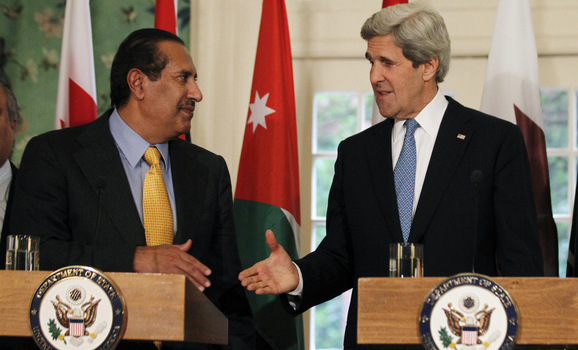 The upheavals shaking the Arab world – Syria foremost – were in effect orchestrated by Doha. The emir – despite his excellent personal ties with Israelis, Americans and other Westerners – has used his clout and unimaginable riches to bring to power and sustain Islamist forces that are fundamentally inimical to the West, to say nothing of their implacable hatred for the Jewish state. With abundant hype, pomp and circumstance the emir visited Gaza last autumn. It was the first such high-profile gesture by a head of state since Hamas seized power in 2007. It allowed Gaza to eclipse Ramallah and demonstrate that the post-Arab-Spring rise of the Muslim Brotherhood bolsters Hamas, itself a Brotherhood offshoot. This yet again underscored the Brotherhood’s reinforced impact, via collusion with Gulf State Islamists. The inherent incendiary potential cannot be belittled, even if US President Barak Obama prefers to obfuscate the gloomy reality he has helped create. No matter what spin was spun, the emir was clearly seen as meddling in the intra-Palestinian squabbles, putting his full political weight behind the utterly rejectionist Hamas that explicitly proclaims its aspiration to destroy Israel. The emir underwrites his support with financial largesse as well. This puts him in league with particularly fanatic forces. He has, for example, been a most generous benefactor to such militant jihadist groups as Jabhat al-Nusra, an al-Qaida subsidiary now on the warpath in Syria. Not to be omitted is the pivotal importance of the Qatar-based al-Jazeera news network, which serves the Thanis’ agenda at the expense of even token journalistic integrity. Al-Jazeera’s inflammatory tendentious reporting has fomented insurgencies in Yemen, Tunisia, Libya, Egypt and Syria. One would therefore assume that such non-too-innocuous intervention would decisively give the lie to Qatar’s purported moderation and peaceful inclinations. But on the opportune occasion of the Qatari prime minister’s recent stopover in Washington, the chameleon switched colors again. Stylishly attired in a dark confidence-boosting business suit and schmoozing Secretary of State John Kerry and Vice President Joe Biden in cordial English, their guest successfully peddled worn old merchandise as a novel revolutionary concept. Needless to stress, Obama’s crew bought it all, lock stock and barrel as per the Kerry/Biden inclination from the outset. Perhaps they altogether suggested the stratagem that they later appeared to laud as an extraordinary breakthrough in attempts to resurrect Israeli-Palestinian negotiations. Of course the raison d’être of these talks is – one way or another – to squeeze Israel back into those incredibly untenable 1949 armistice lines, in effect till June 4, 1967 and now misrepresented as bona fide borders. Been there. Heard that. But so what? When supposed honest brokers determine that the secondhand castoff is in fact spanking new, their say-so ostensibly constitutes a sterling seal of approval. Such recycling in turn becomes a means to ply more pressure on Israel with a perceived fresh Arab concession, which is nothing of the sort. Ramallah figurehead Mahmoud Abbas wasn’t more forthcoming. He couldn’t afford to even appear to be. But even that’s not new. Territorial swaps were already discussed by then-premier Ehud Barak in his near-desperate peace-drive of 2000-2001 that began in Stockholm, continued in Camp David and expired ignominiously in Taba. Barak’s ultra-dovish foreign minister Shlomo Ben-Ami kept detailed journals throughout the negotiations. These featured in a very lengthy interview granted to Ha’aretz’s Ari Shavit. Published on September 14, 2001 and entitled “The Day the Peace Died,” Ben-Ami’s extensive monologue still offers spellbinding insights. Among them is that when territorial swaps were proposed, the Palestinian side “would only consider taking possession of Kochav Yai’r” – where Barak resided at the time. There were also not-so-veiled threats of violence. Chief PLO negotiator Saeb Erekat named September 13, 2000 as a deadline. Two weeks thereafter the intifada raged. Ben-Ami at least learned something. But in 2008 another prime minister, Ehud Olmert, sought to magnify Barak’s errors and then some. Nonetheless, even his remarkable offer was rebuffed. Now Netanyahu is called upon to kvetch once more, if for no other objective than for improving our tarnished image. Here, however, we need to pause and wonder why our image is at all tarnished. It’s mind-boggling how the Arabs can appear so conciliatory when sacrificing nothing, while Israel is regarded as intransigent when conceding endlessly and at great existential risk. It may well be that our reputation is sullied precisely because of our very readiness to concede. Our pliability isn’t without detrimental consequences. Even futile negotiations do great harm down the line. Simply put, egregious territorial generosity undercuts all future Israeli bargaining positions. Once any Israeli representative has kvetched, his kvetch cannot be taken back because only Israel is always required to kvetch. 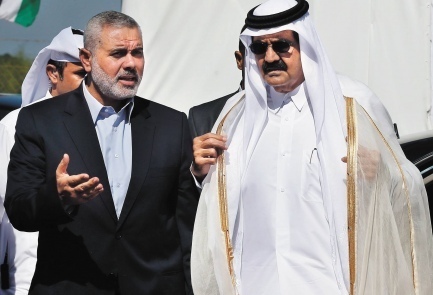 The Arab side’s show of goodwill is eminently achieved merely by sending out members of the Qatari ruling family – or their counterparts elsewhere in oil-glutted Arabia – always in their sartorial best to impress world opinion with suitable blandishments. The ingratiating manners of the movers and shakers from the house of Thani invariably predispose all and sundry in their favor while we keep kvetching. It’s as simple as that: NOT ONE SQUARE INCH ! THAT MUST BE THE BASIC PREMISE ! All of the rest has to be political tactic…I just wonder, if some politicians ever read Machiavellis writings…? In dealing with ones enemies, there is NO SUCH thing as being truthful ! Just talk and talk and talk and KEEP the land, KEEP Judea and Samaria…THAT’S all what has to be done for the rest of Obamas term AND BEYOND !!!!!!! Of course force-initiators exploit the morality of their mortal enemies. hiding guns and surprising their would-be captors. “negotiation” is after you’ve won. Thoroughly. Already you begin to accept defeat. Israeli kvetches can be taken back. Every time I read your posts the sadness is overwhelming. I worry for Israel !Does the world not have eyes and ears! What we have to face up to is that by existing we remind them of their guilt . In order to make everybody feel better if we and Israel disappeared it would ease their pain!!!!!!!!!!!! I understand your feelings very well but, on the other hand, we are so lucky to have a writer as talented and articulate as Sarah Honig to bring us the truth! For all of the state of Israels relatively ‘young life’, from it’s inception in 1948 to the present, delivering ‘Public Relations’ to the world in its own behalf has been nothing but ‘Dismal’. What, with the amazing progress Israel has created to benefit ‘the world of inhabitants’ with its technological advances, farming capabilities, medical inovations, military power, and other ‘positive life contributing comforts and individual freedoms’, Israel (especially through its leftist appeasers) seems to have lost its ‘Aggresive Talents’ in the landscape of Public relations and communication. Israel should stop its ‘Kvetching’ once and for all about its ‘place and stature within the world community’, and Deliver Notice, in no uncertain terms, that ‘Israel has ‘borders and land areas’ that are Not negotiable at any time now or in the future. For those those who continue to try to ‘de-legitimatize’ the state of Israel can go ‘pound sand! The only remaining option for Israel is to demand that the other side put their offer on the table. That should be Israel’s precondition for further talks. the “two state solution” idea, are ripe for subversion and abuse. Doha and Qatar? They weren’t trustworthy back in Ehud Barak’s days as PM, and they still aren’t; despite their $1000 Brooks Brothers suits. My nickel’s worth of advice? Israel should cut off the free food, water, and electricity to Gaza; and refuse ANY negotiations with Haniyeh, Abbas, or the Muslim Brotherhood.